Trulia’s shares are down in after-hours trading following the company’s third quarter earnings report that included in-line losses, and a revenue disappointment. The company lost $0.08 per share on a non-GAAP basis in the period from revenue of $67.1 million. Investors had expected the $0.08 per-share loss, which works out to a deficit of $2.8 million but had expected revenue of $69.96 million. The company missed that by nearly $3 million. On a GAAP basis, Trulia had a very unprofitable quarter: A $10.8 million charge that the company notes is “related to [its] pending acquisition by Zillow” helped the company lose $24.0 million in the quarter, or a stunning $0.64 million. GAAP or not, Trulia’s third quarter of 2013 saw the firm lose a more modest $2.2 million, or $0.06. So, revenue was up 67 on a year-over-year basis, but the company isn’t able to convert that higher top-line to material profit. 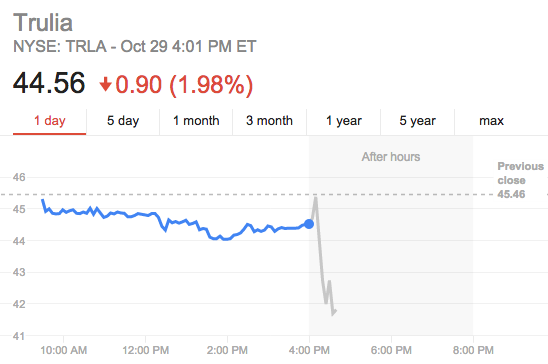 Zillow, which will acquire Trulia, is also down sharply after hours, falling more than 5 percent. The two companies are in the middle of a $3.5 billion deal that has yet to close.